100% payment required 4 weeks before arrival date. A group booking will automatically be cancelled if payments are not received on time. 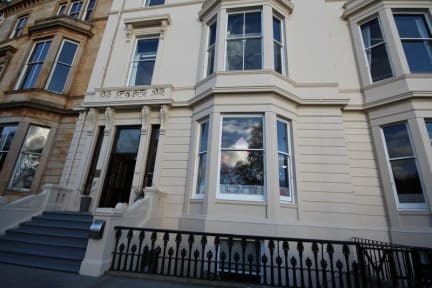 Glasgow Youth Hostel offers four star VisitScotland accredited accommodation in a fabulous Victorian townhouse overlooking beautiful Kelvingrove Park in Glasgow’s lively West End, close to award-winning Kelvingrove Art Gallery & Museum, numerous cafes, restaurants and bars. 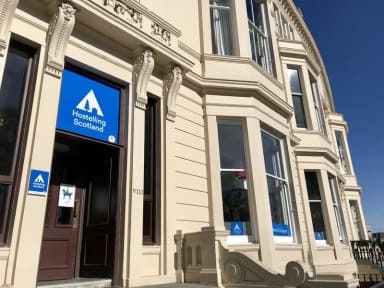 Within easy reach of many of Glasgow’s main attractions, including the SSE Hydro and SEC, this hostel is a fantastic alternative to a hotel and a popular choice for individual travellers, backpackers, families and groups wanting to explore the city on a budget. The hostel offer guests a great range of comfortable en-suite rooms and spacious shared accommodation with private lockers. There’s even a self-contained apartment sleeping up to six people. WiFi is free for all guests and other facilities include a large comfortable lounge with views over the park, television room, games room, laundry, secure bike store and luggage storage for guests arriving early and wanting to explore the city. Reception is open 24 hours a day. There are no car parking spaces at the hostel, but limited on-street Pay & Display spaces can be found in the surrounding area. it was a great stay! clean, friendly, great value for money. Atmosphere is ok, but breakfast room is a little dull. Thnx! Prachtige locatie , zicht op het groene park, in 20' stappen in de stad, industriële keuken !!!! Unfortunately a lot of people are there because they are looking for housing. So you didn't really get the hostel feeling. Also the community rooms where a bit to far away from each other. The room was nice, really hot. Een 5.5. -geen WiFi op de kamers - maar 2 stopcontacten, terwijl er 4 mensen sliepen -de douche kon alleen kokend heet of ijskoud zijn De bedden waren verder prima, en de locatie was erg mooi.